Otis B. Driftwood: Tell 'em you're not here. Fiorello: What if they don't believe me? 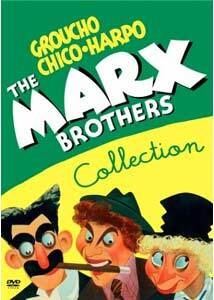 The Marx Brothers have been woefully underrepresented on DVD for far too long, so a tip of the cap to Warner Bros., for helping to right many of those wrongs. A Night at the Opera was the brothers' first movie for MGM, and though it may not rise to the manic stratospheric heights of Duck Soup, it is in many respects their first proper movie qua movie. That is, all the previous Marx Brothers pictures were basically vaudevilles, comic bits of business thrown together with just the barest tether of a structure. This film, though, isn't a transposition; it was conceived as a movie, and it works best that way. But the boys are still as funny as ever, and as funny as anyone; whatever it is that has you blue, this is the cure for what ails you. It's not that their movies are formulaic, exactly, but with Groucho, Harpo, and Chico, we've got three powerful screen personae; their best movies let them do their thing, with the rest of the world serving as their straight men. And heaven knows if any subculture has pretensions worthy of puncturing, it's the world of opera. Groucho plays Otis B. Driftwood, who has improbably convinced the socially ambitious Mrs. Claypool that he can get her in with all the right people�for a fee, of course. It's a set-up that would be laughably implausible in all the wrong ways if Mrs. C wasn't played by Margaret Dumont, Groucho's on-screen foil of choice�the old-world earnestness with which she plays her scenes with Groucho make you wonder if she's in on the joke, and it's hard to know if it's funnier for us if she is or isn't. Harpo plays Tomasso, the much-abused dresser of the evil tenor Rodolfo Lassparri; he is the obstacle between our hero and heroine getting together. They are Ricardo (Allan Jones), with a sweet tenor voice and a sweeter disposition; and Rosa, the leading lady that the rapacious Signor Lassparri has eyes for. Rosa is played by Kitty Carlisle, in what may be her finest hour in the public eye before her many delightful years as a panelist on To Tell the Truth. Chico plays Fiorello, a self-styled agent for the divas; he promises to deliver Ricardo to the big time. Mostly, of course, the set-up is just a convenient excuse for the Marxes to do their thing, and my, do they ever do it�the whole crew leaves Europe for New York, and the comic set piece in which seemingly dozens of passengers and crew members pile into Groucho's linen closet of a state room. The filmmakers had the bright idea not just to have the boys go from set piece to set piece, but actually to give the movie a story, a structure�admittedly things sag a little bit when the fellas are off screen and we're with the young lovers, but it allows the film to have the kind of dramatic propulsion and comic climax that can be lacking in a movie that's just a series of blackout sketches. And of course if your movie is called A Night at the Opera, you're sort of obligated to have some opera�the boys and their own musical interludes are fine, but they're at their best and most fun when they're terrorizing a performance of Il Trovatore to achieve their own comic ends. Comedy since Aristophanes is about puncturing pretensions; the Marx Brothers don't take out the long knives, but they're masters at deflating bloated egos without their victims even knowing they've been eviscerated. The film is also notable for being the Marx trio's first film without the departed and little-missed Zeppo, who was a stiff romantic lead in some of their earlier efforts; and for the fact that the brilliant George S. Kaufman shares screenplay credit. It's hard to know just what is his, but it's also delightful that the leading lady, Miss Carlisle, would go on to marry Kaufman's sometime writing partner, Moss Hart. This is a movie sure to put a smile on your face, no matter your psychological disposition; this is a gift from Warners, so go crazy, because as Chico reminds us, there ain't no sanity clause. Image Transfer Review: The print has been cleaned up considerably, and looks better than the movie has on previous home video releases; but, for reasons that are made clear on the commentary track, some odd elisions in the editing room give a few of the scenes an odd, jumpy feel. It's a movie that punctures high art, not one that aspires to be high art, and the years haven't been kind, always, to the picture quality; but this is about as good as we can expect, and Warner has given us a clean transfer. Audio Transfer Review: The mono track gets the job done, though this is still a movie from talkies in their infancy, and the concomitant hiss, buzz, and crackle are probably inevitable. Extras Review: Explain a joke and you'll kill it, and there's a danger of overanalyzing the Marx Brothers; but this wisely chosen package of extras illuminates the movie without taking away any of the fun. Remarks on Marx (33m:56s) is a smart documentary on just how Arthur, Leonard, and Julius became Harpo, Chico, and Groucho; we're instructed that the proper pronunciation of Leonard's screen persona is "chick-o," and not "chee-ko." (Apparently he was something of a wolf, forever chasing the chicks.) Among those interviewed about the feature are Dom De Luise, Carl Reiner, and Larry Gelbart, along with Kitty Carlisle; it's a valentine to the state room sequence especially, and the principal historical point is about what a good influence Irving Thalberg was on the Marxes. An archival clip (05m:21s) of Groucho on The Hy Gardner Show is also principally about Thalberg. Leonard Maltin provides a chipper commentary track, the strongest points of which are the historical arcana he's tracked down. The original running time of the picture was a good three minutes longer, but all mention of Italy (where the film opens) was snipped out in the cutting room, accounting for some of the jangly shots mentioned earlier. Who deserves the lion's share of credit for the screenplay is a point of much debate; Maltin is particularly good discussing the guys doing dry runs of the material for theater audiences in Salt Lake City, an effort to punch up the jokes, and to know where to leave room for laughs.Two old MGM shorts finish up the package. In the first, Robert Benchley battles insomnia in his classically droll manner, instructing us on How to Sleep (10m:38s). Benchley also appears briefly in the second, full of high style, music and silliness on Sunday Night at the Trocadero (20m:16s), the highlight of which is a brassy cover of I Can't Give You Anything But Love. The world is always a better, funnier, sillier, more anarchic place when we're talking about this kind of Marxism, and A Night at the Opera gives us the brothers at their goofiest best. A smart extras package provides a few more chortles, along with some solid information about the Marx brothers, their evolution, and their creative process. These guys have it all over the three tenors, to say nothing of just about anybody else who ever made a screen comedy.